What if your Refund is a Balance Due? If you have been shocked to find a balance due rather than a refund, be sure to file your return before midnight April 30 to avoid late filing penalties. This is an important first step in keeping more money, even if you can’t pay your bill immediately. Another good option for DIYers: You may wish to have a pro look over your return (or prior returns) to see if they can find something you missed. • 10% of amount owing plus 2% per month for 20 months if you were charged a late filing penalty in any of the preceding 3 tax years. Taxpayers who are found to participate in tax evasion will face more penalties by being charged with an offense. When a taxpayer is guilty of an offense, a criminal prosecution takes place. While in the case of gross negligence, the burden of proof is on the taxpayer; in tax evasion cases, the burden is on CRA to show that there was willful intent to understate income, overstate deductions and credits and that there is no reasonable doubt of the crime. Those convicted of tax evasion face a series of penalties, the most common of which is a fine of not less than 100% and not more than 200% of the tax sought to be evaded or credits sought to be gained. This penalty could also be accompanied by a prison term of not more than five years. This is in addition to the administrative penalties CRA can charge. Author Evelyn JacksPosted on March 25, 2015 Categories Income TaxLeave a comment on What if your Refund is a Balance Due? Retirement planning is changing in Canada, but Canadian seniors are yet to catch up with them. There’s an opportunity for tax and financial advisors to get it right together, but also a significant professional hurdle when the two don’t work together on the same strategic plan. It was just this week that an exasperated new retiree contacted me to tell me that the financial institution she was dealing with was thousands of dollars out in estimating investment income during what she thought was a purposeful year end planning exercise. Now, with the T-slips in hand, the investor finds herself bumped into a new tax bracket, with unfavorable tax results for 2014 and potential increases in quarterly tax instalment remittances, too. If only her tax and financial advisors had been consulted together, results could have been different. If you are a trusted financial advisor, providing a year round tax efficient retirement income planning help is critical, especially if most of your clients are about to enter retirement. You can help your clients better understand the changing rules on postponing CPP and OAS and the increased choices available to them for averaging down taxable income with pension income splitting, incapacity planning and asset transfer options. But if you don’t do so with precision, your reputation will be on the line, and this will come to light at tax time. Retirement income planning – both on the accumulation and on the withdrawal side – is fraught with the threat of irreversible errors. But there are two sides to this coin. Investors must be prepared to invest in a collaborative service and see the value of doing tax-efficient retirement planning on an ongoing basis. Astute pre-retirees demand precision in their after-tax results from all their financial pros. So they would be happy to know about opportunities – now at tax filing time – to minimize 2015 income taxes. Doing a 2015 retirement income plan alongside of the completion of the 2014 tax filings for the family is a smart thing to do. There are many ways to compute a tax return mathematically correctly. The key is to file to a family’s best benefit and that includes avoiding CRA penalties on failure to report income. This is prohibitively expensive: failure to report income on the current tax return and in any of the three prior tax returns can result in a penalty of 10% of the missed income to each of the federal and provincial governments. This is in addition to possible gross negligence (50% of unpaid taxes) and tax evasion penalties (up to 200% of unpaid taxes), plus interest. What this means is that if you missed claiming a $1000 income amount, in the current year and in any of the three prior years (2011, 2012, 2013) you’ll pay a $200 penalty – 10% of $1000 to the each of the federal and provincial governments – ouch! But, just what is the definition of income for tax filing purposes? It’s an important question, because the word “income” has a broad meaning in the eyes of CRA and can include barter transactions. In fact, unless specifically exempt, the definition covers most amounts that are received in cash or in kind within the calendar year; that is, January 1 to December 31. Reporting income for certain businesses and investments may be possible under a different fiscal year. Income received in kind (barter transactions) must be included at fair market value. This can include, at its commercial value, such as a bushel of grain, a gaggle of geese, gold, shares or a variety of services. The onus of proof for fair market valuation is on the taxpayer. Therefore, all indicators (appraisals, newspaper clippings, etc.) to justify the value put on those items must accompany the tax filing documentation, just in case CRA asks. When is income considered to be received? For most taxpayers, income will be reported when actually received. This is called the cash basis of reporting. But, it technically doesn’t have to be received by the taxpayer. It can come through an agent, be deposited directly in a bank account and so on. ‘Though more rare these days, in the case of a cheque, the money is considered to be received for tax purposes when it is deposited at the post office (i.e. when it leaves the hands of the sender). This gives important guidance when you are trying to decide when to report that December-dated cheque received on January 3 in the last tax year (2014) or the current one (2015). These fundamental income reporting basics can make a big difference not only in the taxes payable, but also in the amount of tax credits a family will receive. It’s Your Money. Your Life. Filing on time and without penalty will ensure families get the very best benefits from Canada’s complex tax system. Taxpayers and their advisors may consider this question more frequently as CRA pushes for more electronic communications, such as the provision of email addresses on this year’s tax return. Providing an email address on your tax return will in fact authorize CRA to stop sending out Notices of Assessment and Reassessment by mail; important sources of taxpayer information – including your refund – information which can be shared with numerous stakeholders. Who are those stakeholders? CRA makes reference to the answer on Page 4 of the T1 General 2014. Underneath the taxpayer signature you’ll find small print about why personal information from the return is shared (for tax assessment, audit, compliance, evaluation or verification purposes) and with whom (other federal, provincial or territorial government institutions). The full list of information sharing, is found in InfoSource, which is a series of publications containing information about the Government of Canada’s access to information and privacy programs. According to its home page, the primary purpose of Info Source is to assist individuals in exercising their rights under the Access to Information Act and the Privacy Act. o Public Works and Government Services Canada (Receiver General Payments PWGSC PCU 712). • Provincial and territorial governments (or parts thereof) in accordance with signed information sharing agreements. o For authentication and registration purposes for electronic services. • Where applicable, information pertaining to an individual’s indebtedness may be shared with the tax filer’s debtors and the courts to facilitate attachment. • With consent, information may also be used for personnel security screening purposes for employment with the Canada Revenue Agency. • Information may also be used or disclosed for the evaluation and supervision of CRA officials in the administration of their duties under the relevant Acts (e.g. audit trails), program evaluation (quality assurance and data integrity), compliance and enforcement risk management, strategy development, and reporting and for survey or other statistical analysis purposes. According to InfoSource, these records are stored for up to seven year at a private-sector contractor records storage facility, depending on the type of information, and then are transferred to Library and Archives Canada as archival records. Will taxpayers have the right tax information if they fail to check their emails and “My Account”? Will they be taken by surprise when communications from the above sharing stakeholders arrive? Will they understand that their refunds may have gone to one of those stakeholders instead of their bank? In an era of significant change at CRA, there appears to be significant concern about loss of control of this private information by professionals and taxpayers alike. This is reflected in this month’s Knowledge Bureau poll, which ponders whether taxpayers should provide their email address to CRA. Those who have commented fall into two camps so far, with the “no’s” winning by a long shot so far. It’s Your Money. Your Life. Be sure you know where your tax refund is. In an age of email fraud and the potential for missed responses due to email overload, it may pay to follow its arrival more carefully. 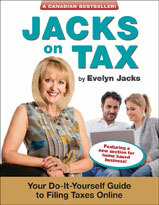 Author Evelyn JacksPosted on March 9, 2015 Categories Income TaxLeave a comment on Where is my refund and who does CRA share it with?